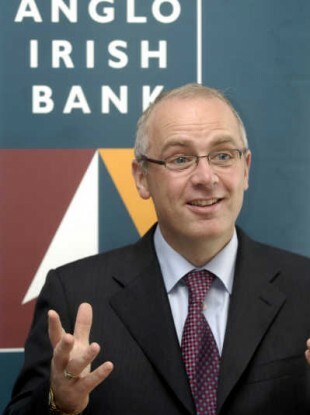 Tanaiste Eamon Gilmore to hear appeal that the government ask US authorities for help in bringing former CEO of Anglo Irish Bank back to Ireland for questioning. ENTERPRISE MINISTER RICHARD Bruton has told the Dail that he will raise the issue of David Drumm’s US visa with Tanaiste and Foreign Affairs Minister Eamon Gilmore. Mr Drumm is wanted for questioning as part of a major investigation by the Gardai and the Director of Corporate Enforcement into Anglo Irish Bank. I understand Mr Drumm has to date refused to co-operate with the investigation. This investigation is dealing with the most serious matters and it is unacceptable that Mr Drumm is refusing to co-operate. Fianna Fail argues that the US authorities should be asked to revoke Drumm’s visa as he is there on an E-2 visa. According to the US Embassy services in Ireland, an E-2 visa is given to someone who is to “develop and direct the operations of an enterprise in which the national has invested or is in the process of investing a substantial amount of capital”. Ironically, since receiving the visa, Mr Drumm has filed for bankruptcy in the US and Anglo has lodged papers with US courts challenging his eligibility to hold this E-2 visa. Richard Bruton, in reply to the question in the Dail, said he would put the issue to Eamon Gilmore as Minister for Foreign Affairs. Email “Call to revoke David Drumm's US visa”. Feedback on “Call to revoke David Drumm's US visa”.